Sun Hats & Wellie Boots: We're Going on a Bear Hunt! 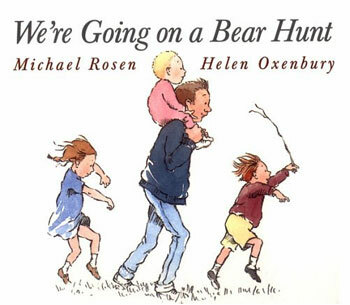 If I had a top five of children’s books Michael Rosen’s wonderful story “We’re Going on a Bear Hunt" would have to be there! Minnie loves the book especially the gorgeous illustrations by Helen Oxenbury, & gets so excited about going on an adventure to find a bear! We’ve shared this book many times, but also enjoy reenacting the story as we walk around our garden. 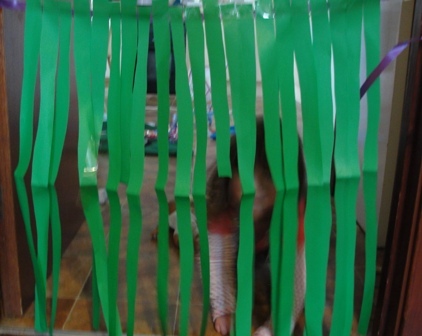 Long Grass – strips of green paper taped to a length of ribbon, which I attached to a door frame. 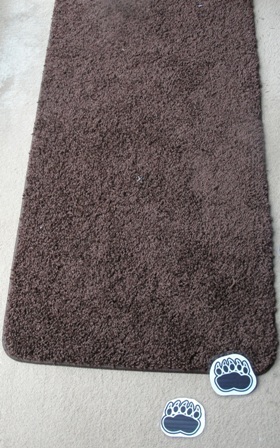 The strips pf paper need to be long enough to touch the floor. (I made sure the ribbon was slightly higher than Minnie to prevent the risk of it catching her neck). 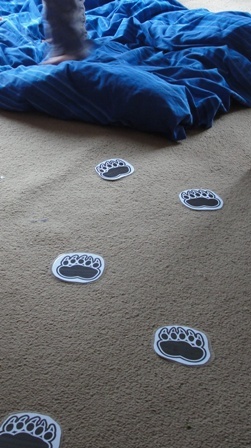 I placed the props in different rooms around the house & positioned the bear paw prints in between them (I spaced these out a little so I didn’t have to use too many). 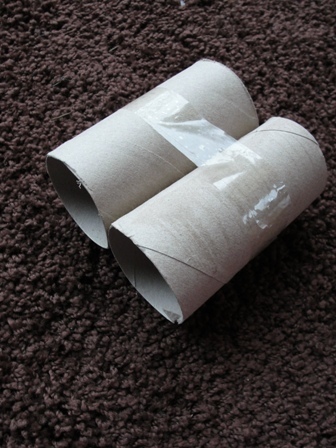 Minnie’s binoculars that she used for our nature hunt & birdwatch were perfect for our bear adventure! 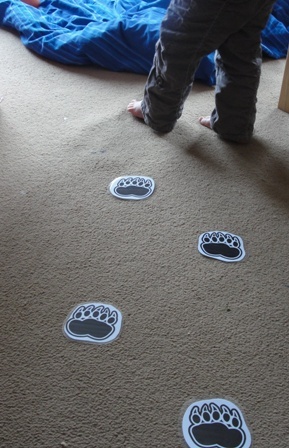 We found some of the pawprints that the bear had left, & I explained that if we followed them we might find a bear. 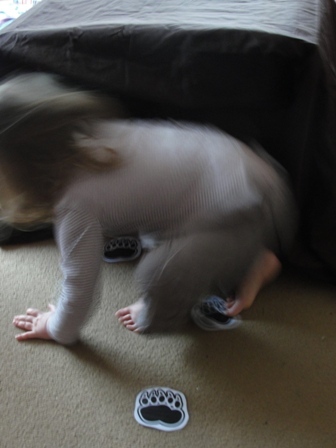 Minnie picked up her binoculars and followed the paws. Once she was out of the river we shook ourselves dry & we were off again following the paw prints. Eventually we came to the mud, Minnie was in her element here! She loved pretending to squelch in the mud & pulled her trouser legs up so they didn’t get “messy”! 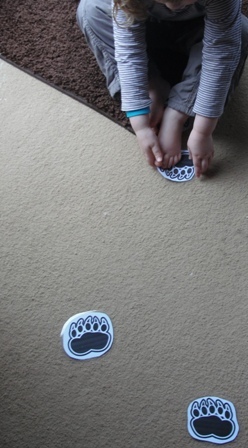 She was then keen to measure her feet against the bear paws, & then used the paw prints like stepping stones as she continued on her journey. 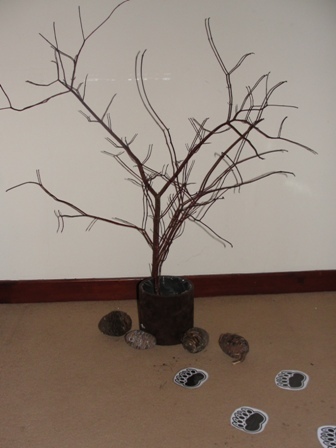 We carried on with the story & the paw prints lead us to a forest. We held hands & stumbled & tripped our way through the trees (& pine cones), then set off again soon to be confronted by a snowstorm. 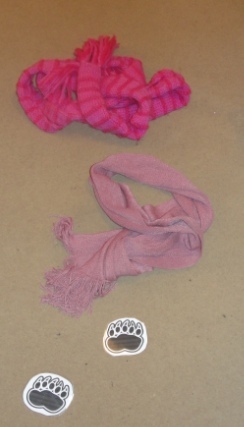 We put on our scarves & twirled around in the snowstorm. I have to say Minnie was very good at the "HooooWooo” sound effects! Now, the original plan for this activity had been to find the bear, then run back along our previous route, run upstairs to Minnie’s bed & cry; “We’re not going on a bear hunt again!” However, Minnie liked the bear cave! 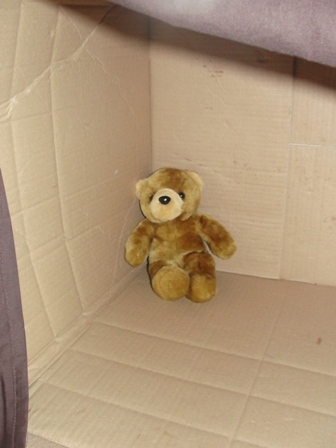 In fact she liked it so much that she played in there all morning! She added more toys, a cushion & a few books (including “We’re Going on a Bear Hunt”) & made a cosy cave for herself and newly found bear! 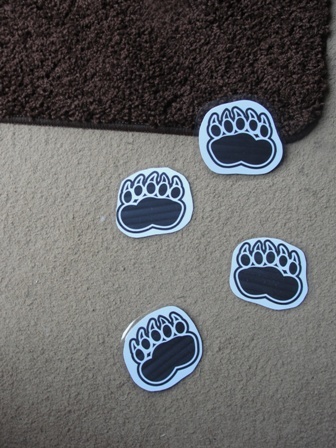 The great thing about laminating the paw prints for this activity is that they can be used again, played with outside, & cleaned easily. I can't wait to set this activity up another day outside. Minnie clearly had a lot of fun with it, & I'd love to leave the props outside all day to see what adventures she has with them.